WELLINGTON, New Zealand (AP) — Fiji’s leader was sworn in for four more years Tuesday after winning an election with a reduced majority, after earlier lashing out at his opponents. 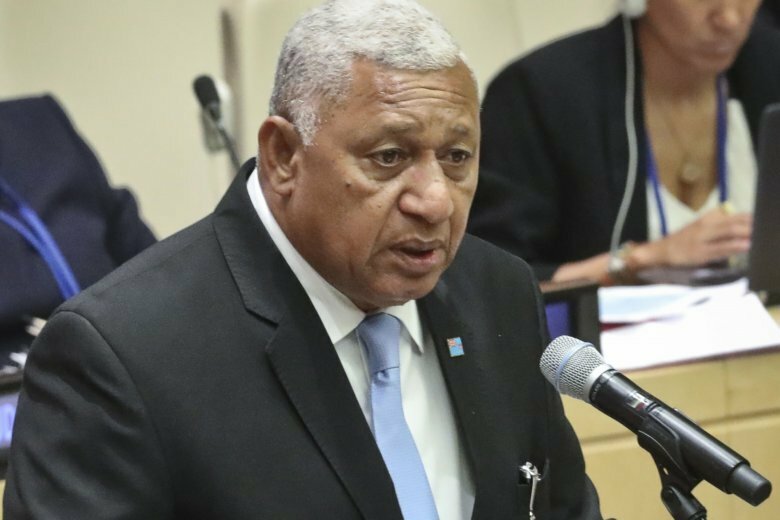 Voreqe Bainimarama was affirmed prime minister in a ceremony in the capital Suva after his FijiFirst Party won just over half the votes in last week’s election, giving them 27 seats in Fiji’s 51-seat parliament. Bainimarama first seized power in a military coup in 2006 and refashioned himself as a legitimate leader after winning an election in 2014. Many people in the nation of 920,000 seem appreciative of the economic gains they’ve made in recent years. Bainimarama said in a statement this week that people had “ganged up” against his party. “Despite the joint forces of opposition that started their campaign based on lies, hate and fear against us four years ago, we have triumphed,” he said. Bainimarama said his opponents had been “aided and abetted” by the Fiji Times newspaper, which many people consider to be the last independent media voice in a country where many news outlets kowtow to the government. A judge in May found an opinion writer and three executives at the newspaper company not guilty of sedition in a trial many believe was politically motivated. The election last Wednesday was marred by heavy rainfall. In an interview with Radio New Zealand, Bainimarama blamed the weather for his reduced majority from four years ago, when his party won almost 60 percent of the vote. He said he had no plans to leave politics. “I’ll be here until I decide otherwise,” he said, before abruptly ending the interview. The main opposition party was also led by a former strongman, Sitiveni Rabuka, who led two racially charged coups in 1987. Rabuka said it was time for Fiji to move on from both him and Bainimarama.